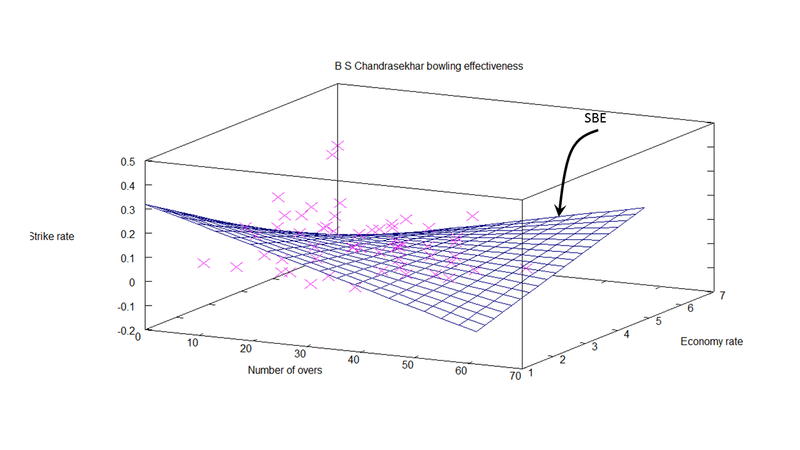 Continuing my earlier ‘innings’, of test driving my knowledge in Machine Learning acquired via Coursera, I now turn my attention towards the bowling performances of our Indian bowling heroes. 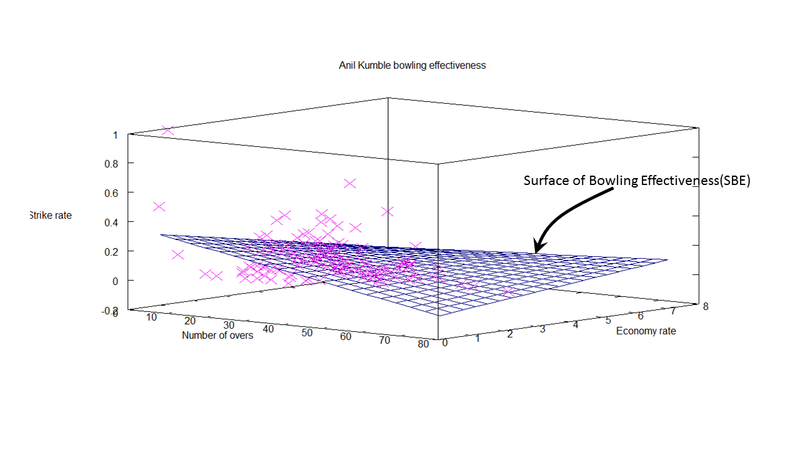 In this post I give a slightly different ‘spin’ to the bowling analysis and hope I can ‘swing’ your opinion based on my assessment. I guess that is enough of my cricketing ‘double-speak’ for now and I will get down to the real business of my bowling analysis! 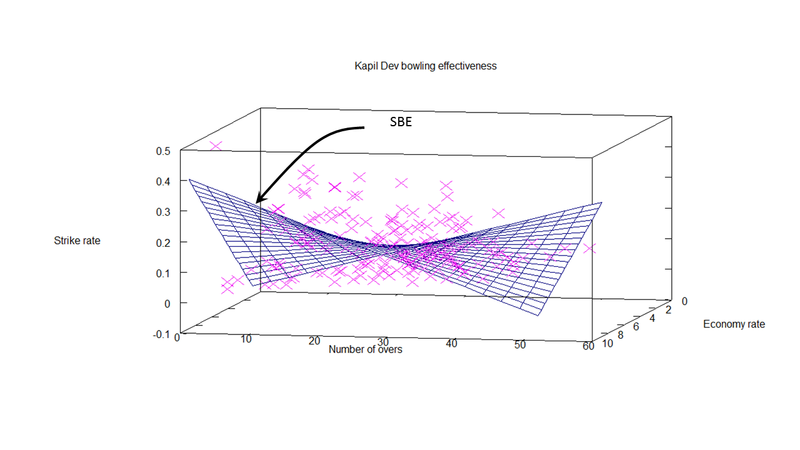 As in my earlier post Informed choices through Machine Learning – Analyzing Kohli, Tendulkar and Dravid ,the first part of the post has my analyses and the latter part has the details of the implementation of the algorithm. Feel free to read the first part and either scan or skip the latter. B S Chandrasekhar also known as “Chandra’ was one of the most lethal leg spinners in the late 1970’s. He had a very dangerous combination of fast leg breaks, searing tops spins interspersed with the occasional googly. On many occasions he would leave most batsmen completely clueless. Kapil Nikhanj Dev, the Haryana Hurricane who could outwit the most technically sound batsmen through some really clever bowling. His variations were almost always effective and he would achieve the vital breakthrough outsmarting the opponent. 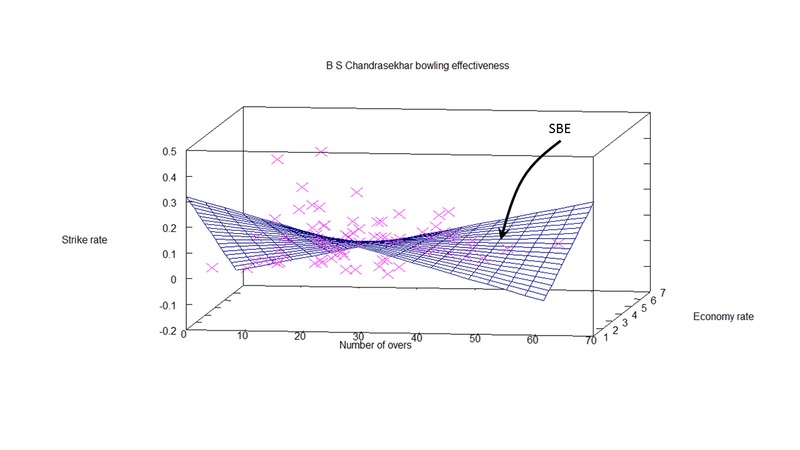 2) The Economy Rate (E) = Runs given/Overs and Strike Rate(SR) = Wickets/overs were calculated. 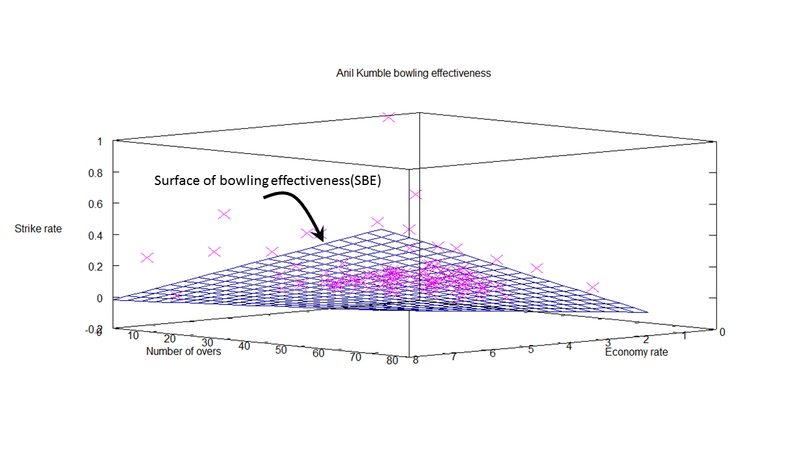 The data of Kumble, based on Overs bowled & Economy rate versus the Strike Rate is plotted as a 3-D scatter plot (pink crosses). The best fit as determined by solving the optimum theta using the Normal Equation is plotted as 3-D surface shown below. 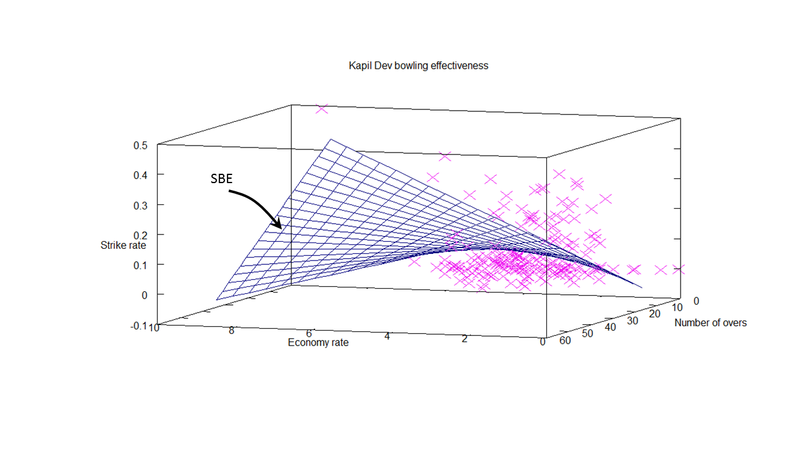 The 3-D surface is what I have termed as ‘Surface of Bowling Effectiveness (SBE)’ as it depicts bowlers overall effectiveness as it plots the overs (O), ‘economy rate’ E against predicted ‘strike rate’ SR. Here are the best optimal surface plot for Chandra with the data on O,E vs SR plotted as a 3D scatter plot. Note: The dataset for Chandrasekhar is smaller compared to the other two. In the previous section the optimum theta with the lowest Cost Function J was calculated. Based on the value of theta, the wickets that will be taken by a bowler can be computed as the product of the hypothesis function and theta. i.e. This is done for Kumble, Chandra and Kapil for different combinations of Overs(O) and Economy(E) rate. Observation: A closer look at the predicted wickets for Kapil, Kumble and B S Chandra shows an interesting aspect. The predicted number of wickets is higher for lower economy rates. With a little thought we can see bowlers on turning or pitches with a lot of movement can not only be more economical but can also be destructive and take a lot of wickets. Hence the higher wickets for lower economy rates! The last one seemed to give me the lowest cost and also seemed the most logical visual choice. 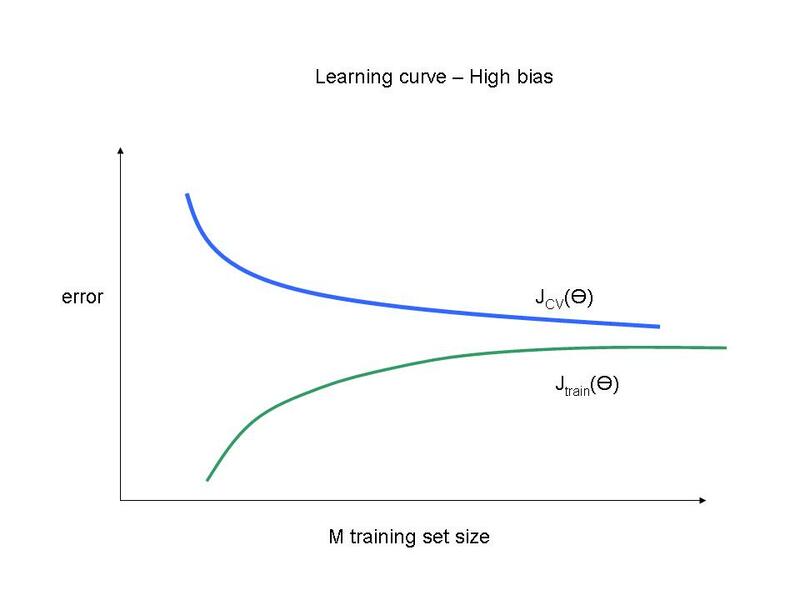 This post takes off from my earlier post Simplifying Machine Learning: Bias, variance, regularization and odd facts- Part 4. As discussed earlier a poor hypothesis function could either underfit or overfit the data. If the number of features selected were small of the order of 1 or 2 features, then we could plot the data and try to determine how the hypothesis function fits the data. We could also see whether the function is capable of predicting output target values for new data. However if the number of features were large for e.g. of the order of 10’s of features then there needs to be method by which one can determine if the learned hypotheses is a ‘just right’ fit for all the data. The above hypothesis does not generalize well enough for new examples in the data set. The hypothesis is learned from the training set. The learned hypothesis is then checked against the 30% test set data to determine whether the hypothesis is able to generalize on the test set also. This is done by determining the error when the hypothesis is used against the test set. The idea is that the test set error should as low as possible. Here‘d’ is the degree of the polynomial. One method is to train all the 10 models. Run each of the model’s hypotheses against the test set and then choose the model with the smallest error cost. While this appears to a good technique to choose the best fit hypothesis, in reality it is not so. The reason is that the hypothesis chosen is based on the best fit and the least error for the test data. However this does not generalize well for examples not in the training or test set. 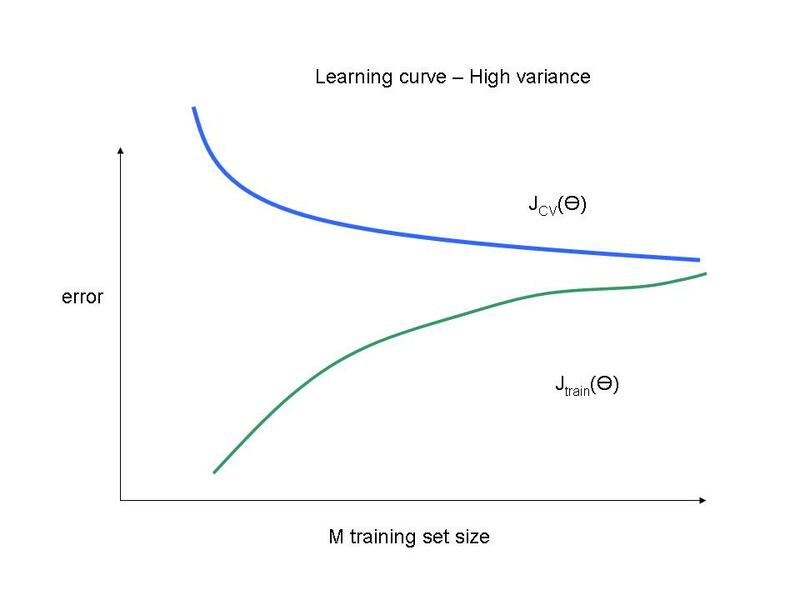 So the correct method is to divide the data into 3 sets as 60:20:20 where 60% is the training set, 20% is used as a test set to determine the best fit and the remaining 20% is the cross-validation set. Use this model against the test set and determine the generalization error. How does the degree of the polynomial affect the bias and variance of a hypothesis? 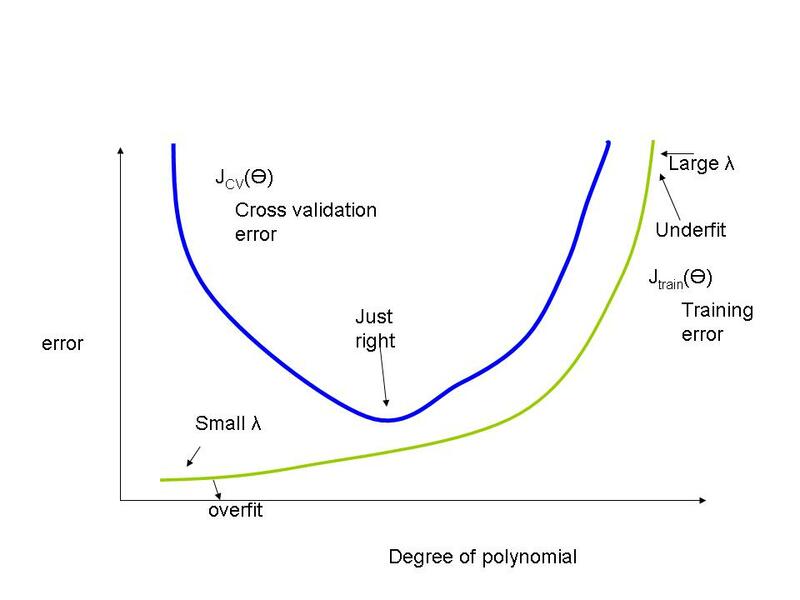 We run all the models with different polynomial degrees on the cross validation set. What we will observe is that when the degree of the polynomial is low then the error will be high. 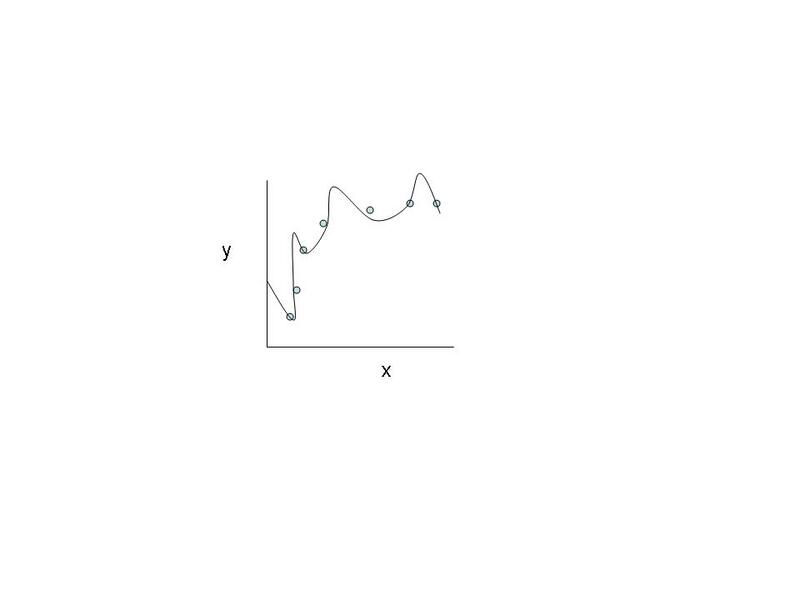 This error will decrease as the degree of the polynomial increases as we will tend to get a better fit. 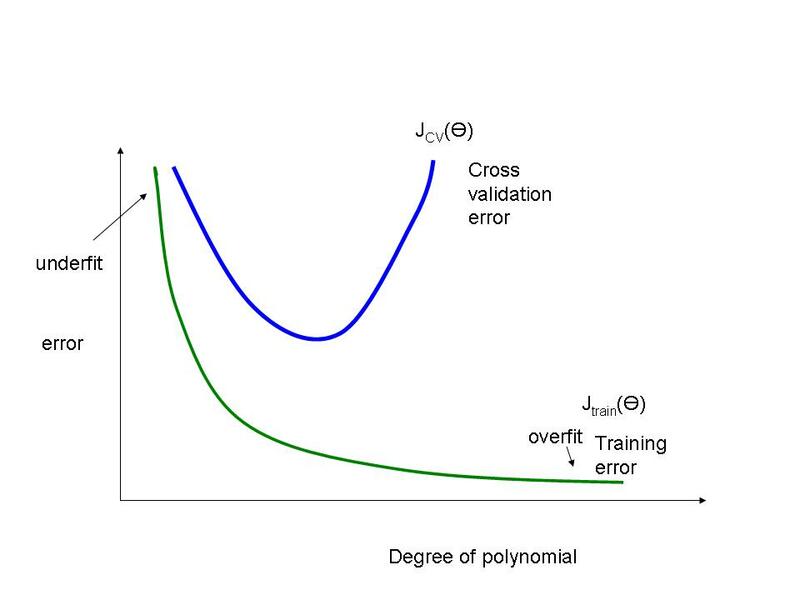 However the error will again increase as higher degree polynomials that overfit the training set will be a poor fit for the cross validation set. 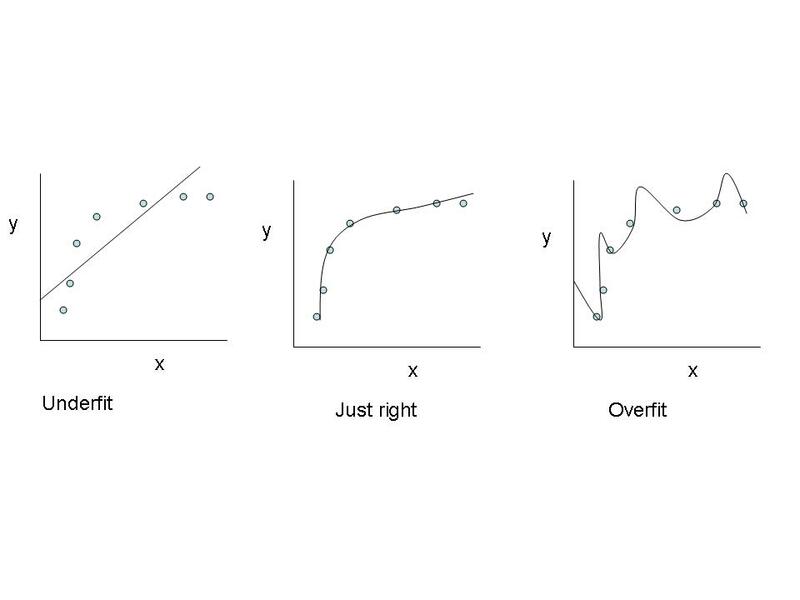 The rightmost figure a much higher polynomial is used. All the data points are covered by the polynomial curve however it is not effective in predicting other values. This is a case of overfitting or a high variance. The middle figure is just right as it intuitively fits the data points the best possible way. 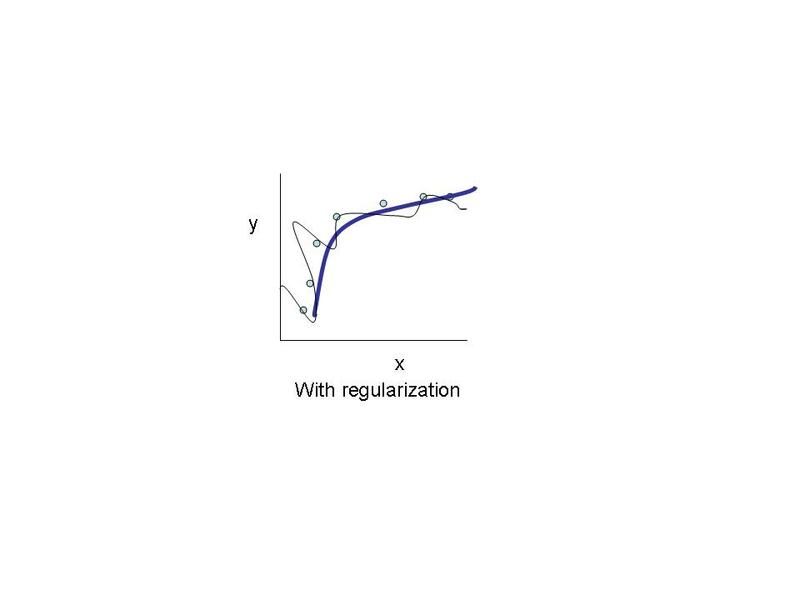 As can be seen the regularization now adds a factor Ɵj2 as a part of the cost function which needs to be minimized. However the trick is determine the value of λ. 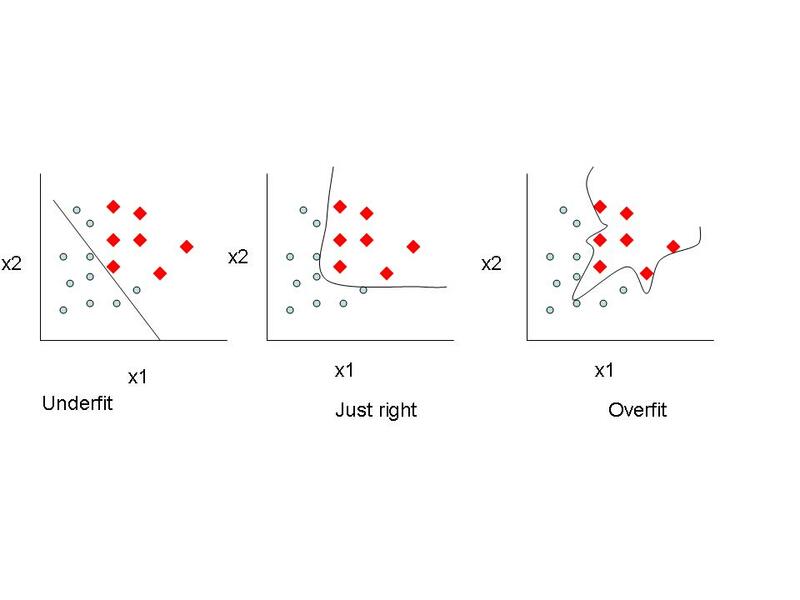 If λ is too big then it would result in underfitting or resulting in a high bias.